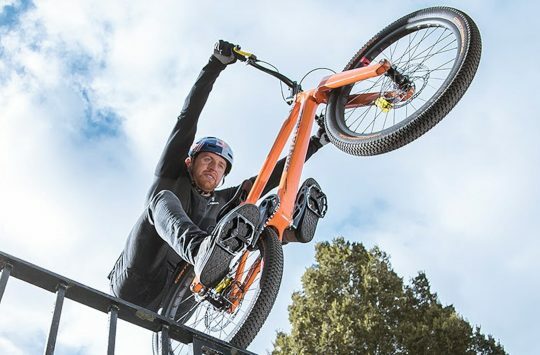 It’s not like he’s short of plaudits but Danny MacAskill (and MTBCut filmaker Stu Thomson) will need to clear a little bit more mantelpiece real estate this weekend. 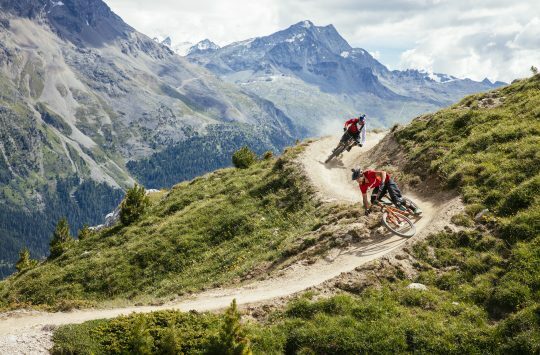 Their ‘Industrial Revolutions‘ short film has won ‘Best Viral’ and the ‘Steve Peat Best Bike Film’ gongs at this weekend’s Sheffield Adventure Film Festival. You can see the rest of the weekend’s programme at the SHAFF website and check out the full results here too. If you can’t see the video then here’s the full text of the interview. Lissa Cook Congratulations – you’ve won in both the Best Bike and Best Viral categories. Danny MacAskill It’s amazing thanks. I don’t really know what to say – prepare a speech! It’s pretty cool to be nominated and to win as well…I feel a sort of disconnection with the films once they’re made. It’s pretty interesting to see where they get to and things as good as the Sheffield Film Festival – it’s amazing. LC You’ve also got the public vote as well because almost five million people have watched Industrial Revolutions on YouTube – it’s quite incredible isn’t it? DM Yeah it’s funny – I find it’s amazing anyone watches the films – they’re just little bike films – it’s funny so many people end up watching them. LC For the completely uninitiated who’ve never seen what you do, what is trials riding? DM Trials riding is in its basic form trying to get your bike up and over obstacles without getting your feet down. I’ve never done the competition side of it because it was down south and I’m from the Isle of Skye. So I just focussed on riding trials in my local village an kind of progressed on with a few tricks so I suppose what I do is more like street trials where there’s no rules to what you can and can’t do and if you put your feet down it doesn’t really matter. LC Have you never done regular MTBing? DM I go out riding a mountain bike. I was always from a very young age into doing tricks, you know skids and really jumping off walls and things. I didn’t use to go on treks into the hills – it was always used for doing tricks on. I mean I’d do a lot more MTB now. Through my teenage years it was more trials riding. These days I ride my MTB pretty much a few times a week. LC How did you find the location for Industrial Revolutions? We were rewatching it and it’s remote out of the way location. DM Making the video – the hardest part is finding the location. I did The Way Back Home in 2010 which involved going to all sorts of remote, rotten bits of concrete in the middle of nowhere in Scotland. So I look a lot on Google and I use some websites where people go to old ruined industrial areas and take photos of them. Myself and Stu Thompson [the director of Industrial Revolutions] just happened to come across this train yard just before I was going on that trip and he was going away so we decided to take a kind of gamble on this one location and it paid off – well it really paid off – it was incredible. LC We talk about it as a viral and I think sometimes people get the impression that they’re thrown together but what’s the reality? How much preparation, practice, shooting and editing goes into that 5 minutes? DM The Industrial Revolutions clip was actually one of the easier videos I’ve ever made. We really landed on our feet with the location – it couldn’t have been any better. We managed to just about get sun everyday for 6 days of filming in Scotland which is incredible. You know I’ve done other projects where it’s rained every day for a week. So we were really lucky but when you find that kind of location it’s about dreaming up the lines and then persevering with what you first started out to do. Nothing happens first time and a lot of things end up being crashes in the beginning as well so. I mean I was actually injured during the whole making of that film as well. I had some kind of phantom pain or loss of power in my left leg so I was struggling with the injury but it worked out and I’m really happy with the results. LC Loss of power in your left knee? DM In my left leg – I actually had a back operation 2 weeks ago – it turns out I’ve had a torn disc in my back for the last couple of years and in 2010 it was back pain and in 2011 I started getting real weakness in my left leg and a lot of pain – turns out this disc had some stuff had oozed out on to my nerve trapping it. I’ve just had that sorted so I’ll be off for another few months but all fine – hopefully I’ll be back on the bike by summer. LC Interesting you say that – we’ve got Chris Akrigg coming to talk on Saturday night at the festival and as you know he fell 40 ft off a cliff – what’s would be your message to him in terms of recovery? DM He’s been through the wars over the years and he’s been riding – I’ve seen Chris in magazines when I very first started riding trials. He’s definitely been one of my heroes of riding or someone who’s influenced me a lot over the years. 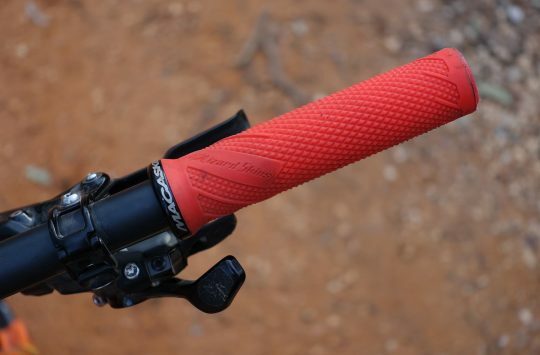 It comes with riding – it doesn’t matter if you’re riding to work every day or doing tricks or downhill you’re going to have a tumble – some are worst that others. I’m quite pleased with not falling off a 40ft cliff! Definitely. Chris’ video actually gave me nightmares when I first saw his crash. It’s excellent to see him back on his mountain bike. And I’m sure he’ll come back stronger than ever – it’s all just about being positive and taking the time to recover properly which I’m quite bad at getting back on my bike a little too early. LC I was going to say – how do you mentally prepare for those tricks – there’s a bit in Industrial Revolutions where you’re going along a rope or a chain? DM It’s kind of tricky – there are some things are harder than they look. The cable ride in Industrial Revolutions wasn’t that hard – it had some sort of girders you could jump off on to. I was quite confident in some ways – it only took about an hour of riding to do which compared to some other lines is not very much. The kind of bigger impact stuff where you’re dropping 12 foot plus or doing flips down drops can be harder to prepare yourself for because you know they’re going to – even if you do them right they’re going to hurt a bit and even with my weak leg some of the bigger drops were a lot of hard work. When you’re filming I try to think I don’t want to look back and wish I’d done something, I’d may as well just do it there and then and I’ll be pleased about the results afterwards. LC You’re incredibly modest. Way Back Home won Best Bike Film and Short last year and Industrial Revolutions has won best bike film and best viral this year so apart from getting yourself on the mend what have you got planned? DM I’ve definitely got plans for another Red Bull project – hopefully this year. This back operation takes a while to recover from – I don’t think I’ll be fully healthy for about 8 months but hopefully I’ll be back on the bike a fair bit before that – cross-country bike for sure anyway. I can’t really give too much away at the moment but I’m looking to mix things up a bit and give everyone something new to watch, something a bit fresh. Should be fun. I really enjoy making the videos and I’m lucky I get free range to go and do what I want to it’s cool.